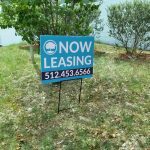 Are you looking for an Hutto sign company that is a dedicated local provider of high-quality signage? 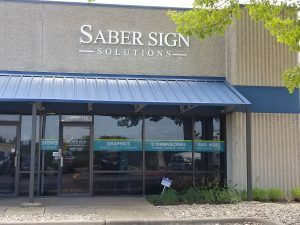 Saber Sign Solutions, located right here in Hutto, is the signage partner your business has been searching for. 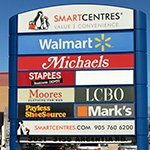 You, like our long list of happy customers, can depend on us to deliver the quality signage you need to make the eyes on the street focus on your company. 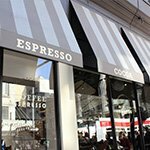 Like a moth to the light, your future customers will only have eyes for your signage. 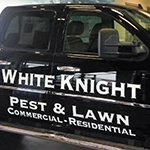 We are your sign shop of choice and are on hand to produce attractive commercial signs of the highest quality for your businesses needs, whether that is your storefront, lobby area, or any other kind of business promotion, education, or customer assistance signage your business desires. 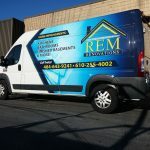 It doesn’t stop there, if you are looking for something a bit more creative we are also experts in custom signs and vehicle wraps, as well as a whole roster of business sign collections. No need to try different companies to fulfill all your signage needs, Saber Sign Solutions is your one stop sign shop. 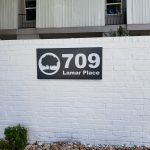 Contact Saber Sign Solutions today at (512) 861-2699 for your Free Consultation with one of our Sign & Graphics expert! 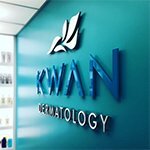 Every signage need, every customer satisfied. 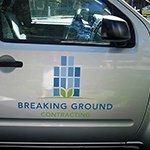 We take on any project, large or small, and take the project from its initial phase with a Free Consultation and stay with you every step of the way to ensure the highest of standards are met. 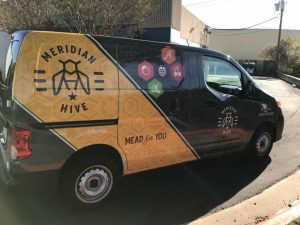 Our team will use their expertise to combine years of experience with their unique skills to give businesses big or small the service and completed signage products our competitors can only dream of. 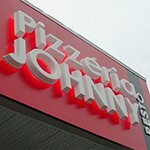 We are passionate about signage, and your business signs will reflect that. At Saber Sign Solutions we have competitive pricing, efficient and sustainable business practices, and unbeatable turnaround times. 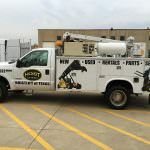 We care about our business and we also care about yours, which is why we believe it is so important to build long-lasting relationships with the businesses of Hutto, so you don’t have to wonder who the right company is for your future signage needs. 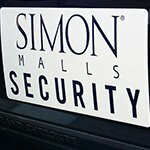 When you make Saber Sign Solutions your partner of choice, our dedication to your project will be evident throughout. This will show in the end product of course, but it will also show in how we handle every step of your signage project. 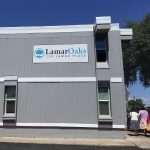 Call Saber Sign Solutions today at (512) 861-2699 for a completely Free Consultation with one of our business signage experts to find out what we can do for your company! 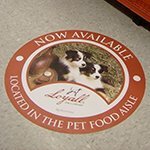 We know that your business is unlike any other and this needs to be reflected in your unique sign. 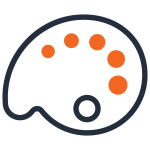 We also know that many businesses have similar needs. 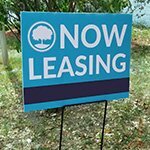 These include retailers, office buildings and all different kinds of service providers, as well as manufacturers and nonprofits. 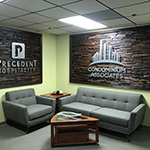 Our experience allows us to define what types of signage will best suit your space, while our creativity allows us to manufacture attractive, unique signs that suit your brand personality, location, and desires. Our customers often comment on our versatility and how we are able to ensure their facilities are attracting and really capturing the interest of their customers or guests. We make appropriate recommendations for the right signage that reflects your business and the industry it is in. A problem many companies have is brand recognition. 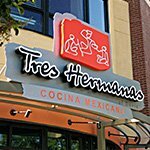 You need a sign making company that can really capture the customer’s eye, and make it instantly recognizable. It doesn’t matter what it is, whether it is your main storefront sign, or a simple wayfinding sign inside the building, it all reflects what kind of company you wish to be known as. 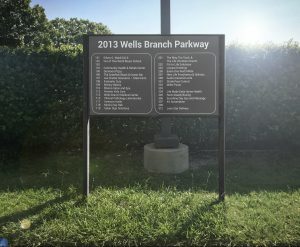 The attention to detail we adhere to is what makes us the most professional sign manufacturing company in Hutto. This is surely the most important place to start for any business. 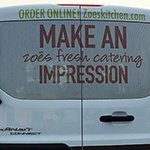 Your brand must catch the eye and make a real impact. Think of it like a first impression, you only get one so make it count! 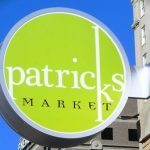 This sign will be vital to attracting your target clients and converting them into shoppers that keep coming back. 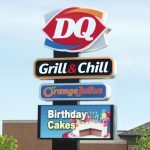 It doesn’t matter what style of sign you would like, from channel letters and LED signs, to banners and promotional vinyl signs, we have made many masterpieces that have seen instant foot traffic and sales increases. 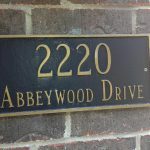 Interior signs help you to follow through on any intrigue or promise you may have created through your exterior signage. 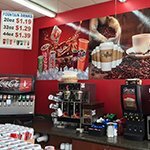 It is important to build on the good work you have already done that has brought the customers inside, reflecting the tone of your outdoor signage with your indoor signs. 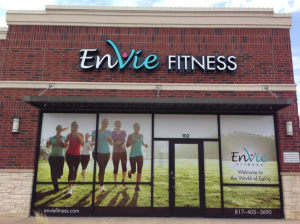 Attractive, coherent indoor signage that is cohesive with your other signs can have a real impact on your overall client perception of your business and brand. 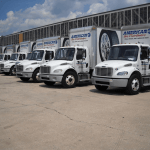 We understand that this all depends on the type of business you run. Your business is unique, but it also fits within an industry that has certain expectations or regulations. 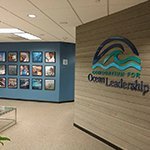 Professional buildings often require lobby signage that really puts the brand at the focal point, and makes it easy for your clients to navigate the facilities with wayfinding signage. On the other hand, a retail store might wish to display signs that promote their highest-margin or sale products. Even schools need signage to inform, encourage, and inspire. 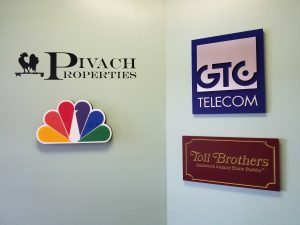 We understand the unique needs of every one of our partners, and have a custom signage solution for every need. 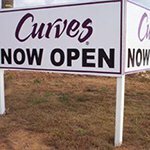 We look forward to creating the perfect signs to keep your customers coming back. 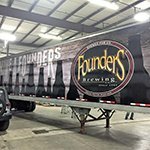 We understand the importance of clear branding that is instantly recognizable and visible for commercial vehicle wraps. 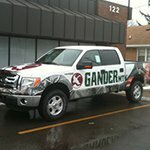 Saber Sign Solutions is your partner for well-designed, memorable vehicle wraps and graphics that catch the eye of everyone you pass. 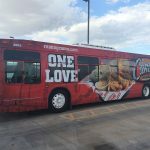 We provide complete vinyl wrap services, including the design, fabrication, and installation of your custom promotional wraps. 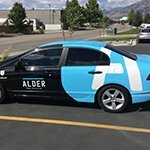 We can wrap any vehicle of any size with your desired information, images, or marketing messages to ensure that you can’t be missed, whether driving to appointments, parked at a client’s home, or at your own business. 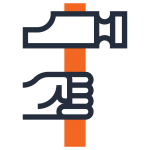 We cater to all types of businesses, so no matter what industry you are in we can make your business visibility the best it has ever been. 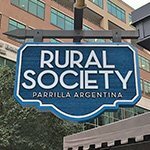 Need us to create a unique sign for your brand, business, or event? 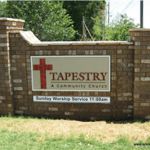 Saber Sign Solutions is Hutto’s provider of attractive custom signs. With a vast selection of signage products as well as material types at our disposal, we have everything we need to create the perfect custom sign for your needs. 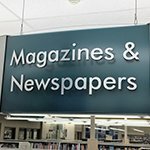 We are just waiting for your branding elements and unique design ideas to create the sign you have been dreaming of. Custom signs are more than just odd signs or quirky signs. 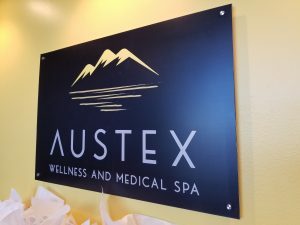 Just about every sign created by Saber Sign Solutions is a custom sign, reflective of our client’s brand personality and unique desires for their business promotion. 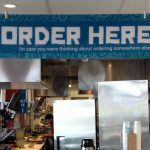 Custom signs can vary greatly in complexity and cost, and our specialists will make recommendations appropriate to your needs, wants, brand, and budget. 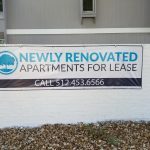 Call Saber Sign Solutions at (512) 861-2699 for your Free Consultation with a sign specialist today! 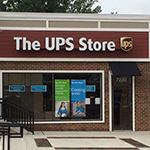 The first step towards your unique sign is a free consultation with one of our experts. This is where we will discuss your requirements and really get to understand what it is you are looking for when promoting your business. 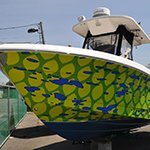 We will take our time as this gives us the chance to really go in depth and find out as much as possible about who you are, your business, the brand and all your signage needs. We’ll discuss what it is you’re looking for and when you need it by, then start working immediately to make it a reality. Onto the next step and this is where your ideas are in the hands of our graphic design team who will study your requirements and any files you might have sent over for ideas. This will give them a feel for your companies branding, allowing them to create a design that captures the tone of your business. Once our designers have something they are happy with, we will provide a proof of the completed sign for you to review. 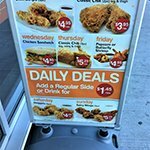 This gives you the chance to really get a sense of what your design will look once installed, and gives you the opportunity to make edits or amendments before the actual sign is made. Once the sign sample has been reviewed and approved by you, the next stage is manufacturing. Sign fabrication is completed in our state-of-the-art facility right here in Hutto. We use only the most modern materials and equipment to ensure your sign is the most attractive and high-quality it can possibly be. Just because we offer high-quality, does not mean we aren’t competitive when it comes to cost. 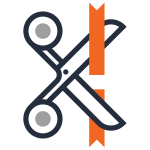 We want to save you money as well as time, so we work as efficiently as the project allows. 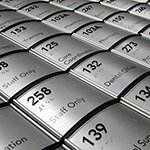 We pride ourselves on our quick turnaround time and our aim is to give you a completed sign that represents the unique capabilities of your company. Having a sign that looks great is one thing, but for a sign to have the desired effect it must be installed properly. We have a dedicated sign installation team that ensures the end product reflects the quality of the design, with attractive finishing. 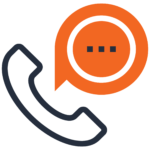 It doesn’t matter if there are codes to comply with, permitting to be completed, or electrical installation needed, we handle everything for you. 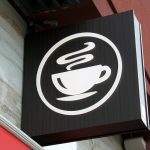 Your sign should reflect the high-quality work your business performs, and professional installation will ensure this. 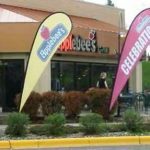 At Saber Sign Solutions, we know the impact that an attractive and expertly made sign can have on obtaining new customers, and retaining them for many years. Your satisfaction is our end goal and that is why we will be with you every step of the way and take ownership of the whole process. If, for any reason, you are unhappy with any part of our service, we will do everything we can to make it right, that is our promise to you. 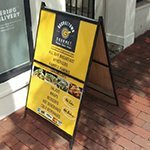 We want to build relationships that last as long as our signs. 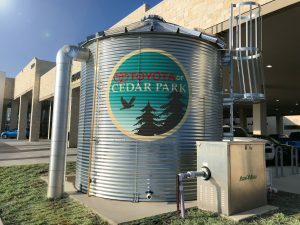 Contact Saber Sign Solutions today at (512) 861-2699 for your Free Consultation with one of our Hutto Sign & Graphics expert!